Recently opened 195 room Hotel. Spacious and cheerful public areas. Special emphasis on sport, fitness, with squash and heated indoor/outdoor pool. Discounts for Online Booking. 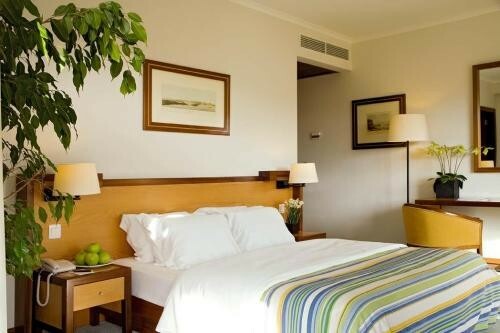 Real Bellavista Hotel & Spa was opened in 2002 and has 195 rooms specifically designed to provide comfort to both the holiday visitor and businessman. 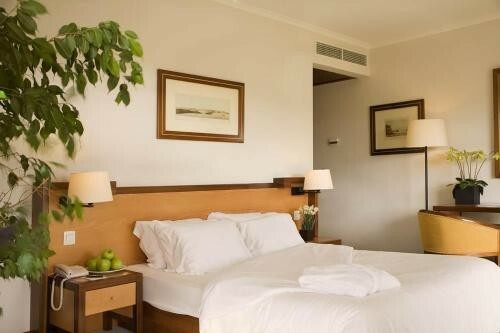 Being part of the newest 4-Star Hotel chain in Portugal you will find in the guest rooms and suites all the modern facilities at a high international standard. The hotel is designed for handicapped guests with 3 rooms specially adapted. Real Bellavista Hotel & Spa has been architecturally created to make sure that the public areas are truly comfortable and enjoy a feeling of space and privacy. The two Bars are happy places for enjoyment whilst the main Restaurant offers an international and local menu in a cheerful bright atmosphere. The hotel has also taken seriously both health and sport. There is a well-equipped Fitness and Aerobic Workout room coupled with Sauna, Turkish, Scottish, Massage and Jacuzzi. Facilities “in-house” include squash courts and an indoor-outdoor swimming pool that is heated in winter. Within 200 metres are Tennis Courts, Mini-golf, and the 2nd Division “Imortal” Football Club of Albufeira. Not too far away there is a choice of golf courses, lawn and ten-pin bowling, cinemas and a major shopping centre, and the motorway to both Lisbon and Spain. 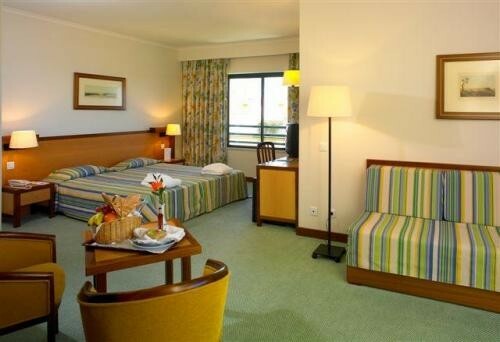 As the hotel is also located within easy distance of major shops and the famous “Albufeira Strip” there is a Courtesy Bus provided to take guests to both to the beaches and to the old city centre. For the “mini-guests” a special team provides a programme of children’s animation activities. Inside the hotel there are multi-functional conference rooms (1 to 14) for up to 110 guests and suported by a business centre. In the basement there is also a paid underground garage area with 80 car spaces. Our staff work to our motto, “small details make all the difference”. We look forward to greeting you as our guests. Includes a work desk, balcony and free underground parking, in-room VIP services and use of the spa area. Spacious suite with large, separate sitting area with sofa, work desk, balcony and a marble bathroom. 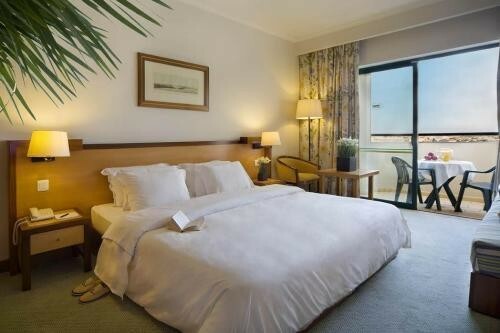 Guests of this room are provided with free parking and use of the spa area.